Dramatically improve your trading in 30 days or less. I wanted to take a few minutes to briefly introduce myself and Dynamic Trader and what I think is an exceptional opportunity to dramatically improve your trading results. Dramatically improve your trading results in 60 days or less. This is a bold statement, but I think it is completely realistic if you have the desire and commitment to improve your trading. 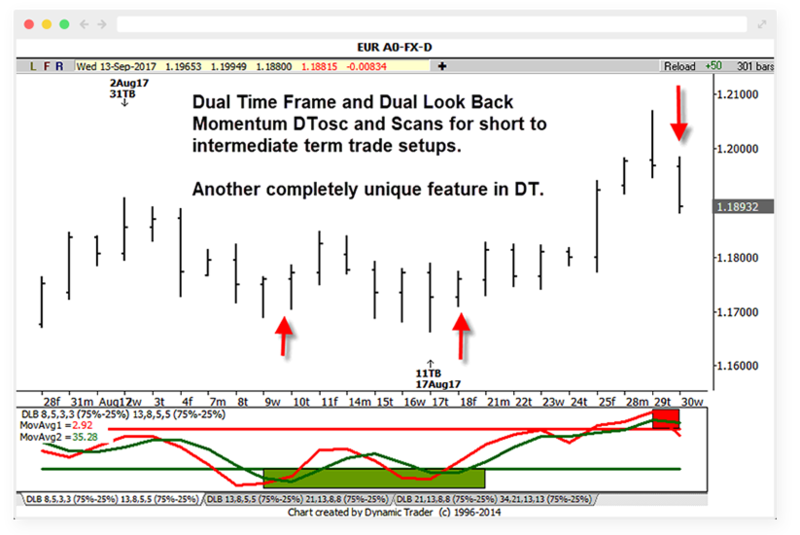 Most of you have reached this page from a referral from another trader or one of the many analysts or trading educators that use my DT software and have learned many of the unique and practical trade strategies I have used and taught for almost 30 years. You can learn everything about the features of DT and the educational material included with the software on the DT Software pages. DT is not competing with most trading software and platforms that offer a confusing and overwhelming smorgasbord of features that are often irrelevant to successful trading. We focus on doing a few things in exceptional and unique ways that give traders a practical advantage to make high probability trading decisions with minimum risk. 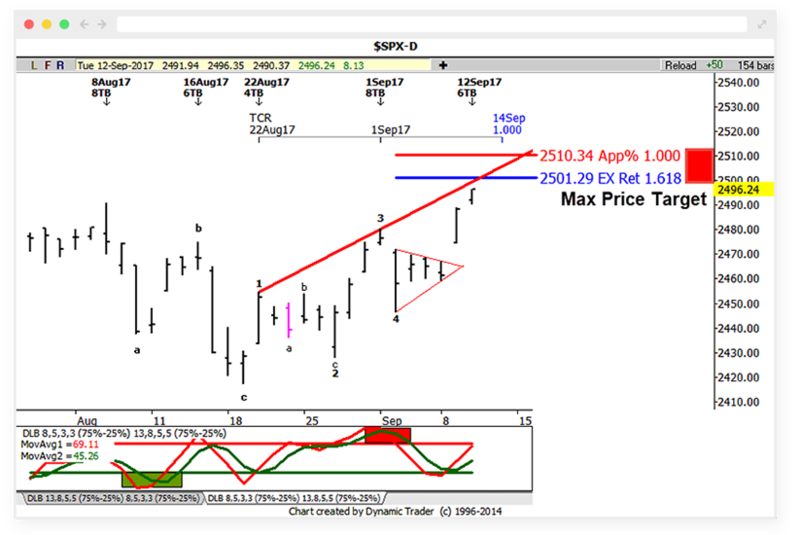 If you want to go beyond simple Fib time and price strategies, DT is for you. If you want to learn multiple time frame trade strategies which I think is a critical strategy for trading success, DT is for you. If you want to learn the strengths and weaknesses of momentum position and how it practically fits into a trading plan, DT is for you. 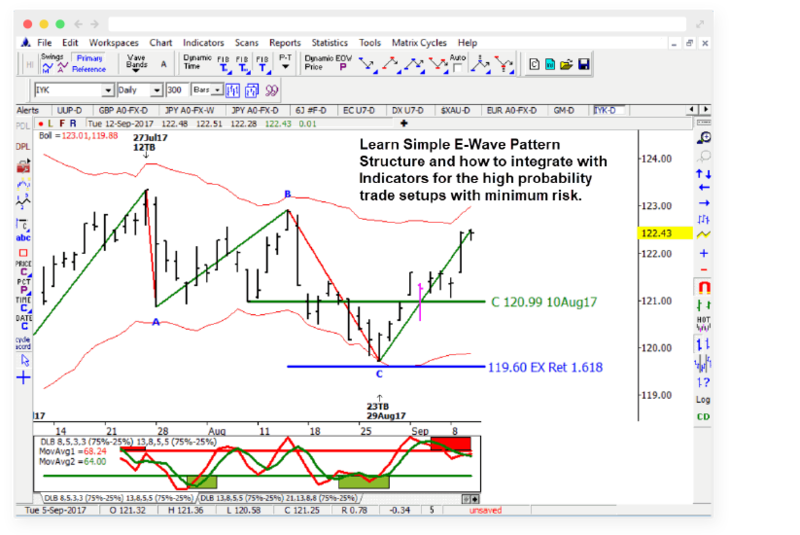 If you want to learn a few simple pattern strategies based on my simplified approach to Elliott Wave, DT is for you. 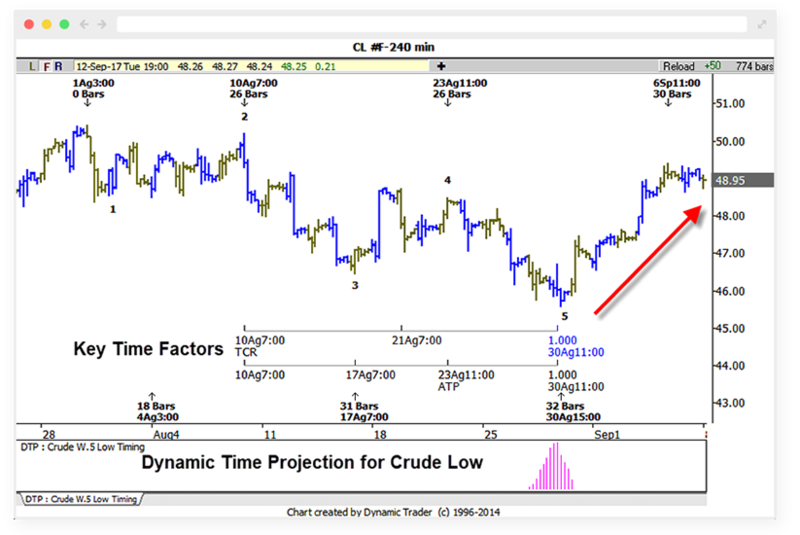 If you want to learn a comprehensive trading plan from entry to exit, DT is for you. It doesn’t take long to master DT trade strategies. All you need is a commitment to improve and master the strategies for any market and any time frame. I hope you’ll join the global DT community that has been constantly growing and prospering for over 20 years. Enough of my introduction. 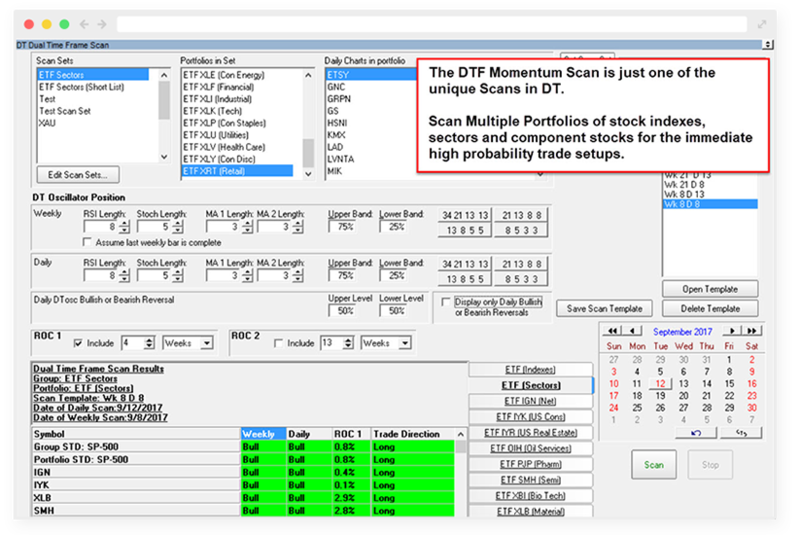 To learn everything about the Dynamic Trader Software and Trading Course, CLICK HERE or go to the DT Software tab. I look forward to being of service to you for many years to come. For a limited time to celebrate our new website, we have reduced the price of DT7 to under $1,000 for the first time in over 20 years. 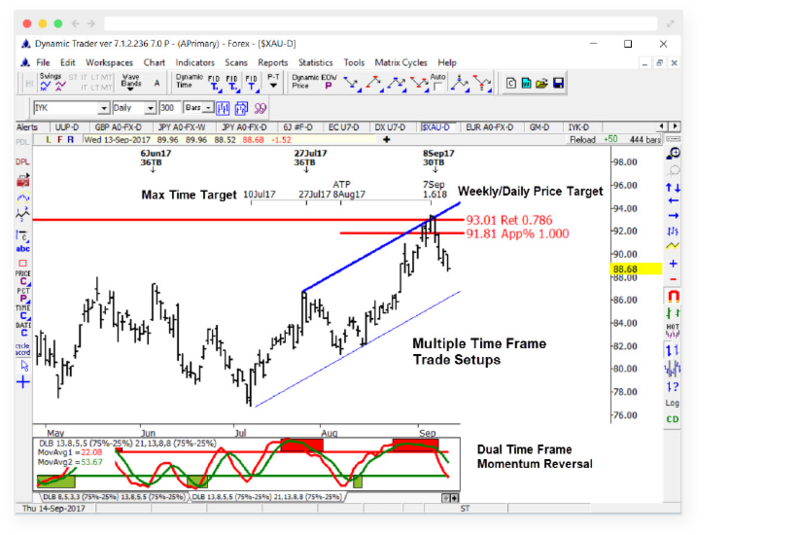 If you have ever been interested in this unique and comprehensive charting program and learning videos, NOW IS THE TIME TO TAKE ACTION. The Required and Inevitable Disclaimer: No specific results are guaranteed. Trading futures, options, stocks or Forex is risky. Make your own decisions. Trade at your own risk. We do not solicit testimonials but when they come in, we often ask our clients for permission to share them with others. Here are what a few of our clients have to say about the Dynamic Trader software, reports, and trading education. It has been more than a year now since reading your book and watching all of your training products – and I wanted to express my undying gratitude for the results since getting my “Miner” in trading. Best net year ever, highest win to loss and profit to loss ratios ever, lowest expenses ever (fewer trades), most consistency and a clearly defined trading plan so mechanical. I credit you with the majority of the process and really, really thank you for sharing your knowledge. Bob – I just can’t thank you enough. I still can’t believe I have accomplished this much in such a short period of time. I feel I now understand and have a better feel for what is really happening in the markets more than I ever did before. You made me think. As you know, I have been studying and putting into practice your educational material for years. Your newsletter has been like having an ongoing real-time workshop. I can’t believe this program (Dynamic Trader). Why aren’t you selling it for ten times its price? Any person who is serious about trading and wants to learn about the markets should study your course material and use the Dynamic Trader program first before they waste a lot of money on all of the useless and overpriced stuff out there. Thanks again for turning my trading life around. I can’t thank you enough. Congratulations again for Dynamic Trader. It certainly is the crowning achievement of your service to us traders and investors. Even though you are in the business of teaching traders, it is refreshing to find a teacher who gives so much personal service, insight and wisdom to his customers. The trading game is tough, but, thanks to you, I am ahead of the game.